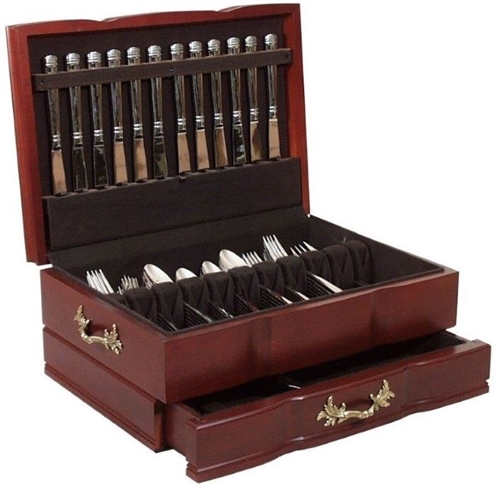 The "Grandeur" Flatware Chest by American Chest is their most luxurious piece and will hold over 180 pieces of silverware plus large serving utensils in the full bottom drawer. Solid cherry hardwood construction means it will last a lifetime. Side brass-finished pulls and side handles with curved front make this a beautiful addition to the former dining room. Made in USA. Mahogany Finish. is required for an item cost refund upon our receipt of the item. 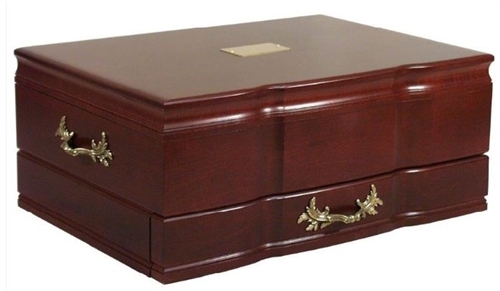 tree bestowed to each chest made by American Chest Company.